I was reading Hitler: The Missing Years (1957) recently. The book is by Ernst Hanfstaengel, one of Hitler's first financial backers. Hanfstaengel became one of Hitler's inner circle. He was one of his earliest financial supporters and in March, 1923, provided $1,000 to ensure the daily publication of Volkische Beobachter. The newspaper, an anti-Semitic gossip sheet had previously appeared twice a week. With Hanfstaengel's money it was published every day. This was a real breakthrough as it enabled Hitler to build up both membership and funds. Hanfstaengel claims that he was encouraged to meet Hitler by Major Truman Smith, as assistant military attaché at the American embassy in Berlin. This might seem surprising but it reflects the role of intelligence agencies soon after the First World War. 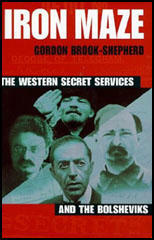 We now know that the head of MI6 in America, William Wiseman, was funding anti-Bolshevik groups in Russia since 1917. Was Truman Smith arranging funds for anti-socialist groups in Germany? I decided to do some research on Truman Smith. I found his papers are lodged at the the Hoover Institution Archives. In a biographical note it said he was involved with Charles A. Lindbergh in the 1930s. I have a copy of Lindbergh's Autobiography of Values (1976) and A. Scott Berg's biography Lindbergh (1998). These sources reveal that that Truman Smith was definitely working for military intelligence in the early 1920s. He completed a course at the Command and General Staff School at Fort Leavenworth. He then became an instructor at the U.S. Infantry School until 1932 when he attended the Army War College. He then served with the 27th infantry regiment in Hawaii. In 1935 Truman Smith was appointed as military attaché in Berlin. He was told that his chief responsibility was "to report to Washington about the growth of the German army, including the development of new weapons and new battle tactics." In 1936 he arranged for Charles A. Lindbergh to visit the country. Lindbergh wrote to his mother about the proposed trip: "Comparatively little is known about the present status of Aviation in Germany, so I am looking forward, with great interest, to going there. Even under the difficulties she has encountered since the war, Germany has taken a leading part in a number of aviation developments, including metal construction, low-wing designs, dirigibles, and Diesel engines. If it had not been for the war she would probably have produced a great deal more. On the other hand, if it had not been for the war it is doubtful whether aviation would be as far advanced as it is today." Lindbergh liked what he saw and argued that "Europe, and the entire world, is fortunate that a Nazi Germany lies, at present, between Communistic Russia and a demoralized France. With the extremes of government which now exist, it is more desirable than ever to keep any one of them from sweeping over Europe. But if the choice must be made it can not be Communism." Lindbergh believed that the Germans were "especially anxious to maintain a friendly relationship with England" and that they had no "intention of attacking France for many years to come, if at all," and they seemed "to have a sincere desire for friendly relations with the United States, but of course that is much less vital to them." Lindbergh was invited back in 1937 and as a result of this visit Truman Smith wrote a report, "General Estimate (of Germany's Air Power) of November 1, 1937." The four-page survey included the following passage: "Germany is once more a world power in the air. Her air force and her air industry have emerged from the kindergarten stage. Full manhood will still not be reached for three years." He said that Germany had already outdistanced France in its technical development and had all but closed the gap on Great Britain. "A highly competent observer (Charles Lindbergh) estimated that if the present progress curves of (America and Germany) should continue as they have in the past two years, Germany should obtain technical parity with the USA by 1941 or 1942." Despite his report, Congress cut rather than increased War Department requests for appropriations for the Army Air Corps. In November, 1938, Truman Smith arranged for Charles A. Lindbergh to visit Nazi Germany again. Great controversy was caused when Lindbergh received a medal from Hermann Goering. Lindbergh later claimed that he had no idea it was going to happen: "Goring was the last to arrive. I was standing at the back of the room when lie came through the door, wearing a blue Luftwaffe uniform of new design. He seemed less stout than when I last saw him. Heads turned and conversation dropped as Ambassador Wilson advanced to meet his guest of honor. I noticed that Goring carried a red box and some papers in one hand. When he came to me he handed me the box and papers and spoke several sentences in German. I knew no German but I soon learned that he had presented me with the Order of the German Eagle, one of the highest decorations of the government by order of der Fuhrer", he said." Lindbergh was roundly condemned for accepting the medal. The Secretary of the Interior, Harold Ickes, asserted that anyone who accepts a decoration from Germany also "forfeits his right to be an American". The New Yorker on 26th November, 1938, commented: "With confused emotions we say goodbye to Colonel Charles A. Lindbergh, who wants to go and live in Berlin, presumably occupying a house that once belonged to Jews." When they returned to the United States both men were accused of being Nazi sympathizers. This view was re-inforced by Smith's support for the 1937 Neutrality Act and his opposition to American involvement in the Second World War. 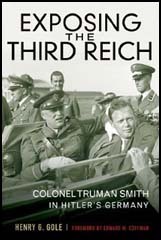 According to Smith's biographer: "Both men were denounced in the press as fascists and henchmen of the Third Reich. The accuracy of the Lindbergh-Smith reports were questioned and dismissed as defeatist propaganda."